Dental crowns are designed to cover a tooth that has been damaged from trauma or decayed by bacteria, helping to enhance its strength, appearance, and function. If a cavity has become too significant for a tooth-colored filling to correct, a porcelain crown may be the ideal treatment, often saving the tooth from eventual extraction. In addition to “capping” damaged/decayed teeth, dental crowns can also be secured to the top of dental implants, providing a durable, natural-looking replacement for missing teeth. At our practice, Colin Morton, DDS is highly experienced in custom-designing and placing porcelain dental crowns with exceptional results. To learn more about dental crowns, we encourage you to browse the information provided below. If you have any questions, or if you would like to meet with Dr. Morton to find out if dental crowns would be right for you, please call or contact our office online today to set up an appointment. Dental crowns are most commonly used to repair badly decayed or damaged teeth, whereas porcelain veneers are typically utilized to conceal aesthetic imperfections on teeth. Both of these procedures can provide cosmetic and restorative benefits, but each has its unique advantages. Porcelain veneers are thin shells affixed to the front of teeth that have stains, chips, gaps, cracks, and/or a worn-down or misaligned appearance. Porcelain crowns are designed to cover the entire tooth, protect it from further structural damage, and enhance its function and appearance. During a consultation, Dr. Morton can determine which procedure will most effectively address your particular needs and concerns. As an added benefit, each dental crown from our dentist is custom-designed—meaning it should fit, feel, and look like a real tooth. Dental crowns can be made from a variety of different materials, including porcelain, resin, gold alloys, and base metal alloys. At our practice, Dr. Morton generally chooses to utilize porcelain crowns over other options due to the numerous advantages this type of dental crown offers patients. Not only is the porcelain material durable, it also yields an incredibly natural look and feel that can blend seamlessly with surrounding teeth. What Does the Dental Crown Procedure Entail? At your initial visit to our practice, Dr. Morton will meet with you to discuss your concerns. If he determines a porcelain dental crown is right for you, he will create a treatment plan based on your specific needs and goals, as well as answer any questions you may have. The actual dental crown procedure is typically completed in two separate stages. During the first visit, the affected tooth will be numbed, and any decay in or around the tooth will be removed. The tooth will then be shaped, and an impression will be taken to help ensure the dental crown is precisely designed for an optimal fit. 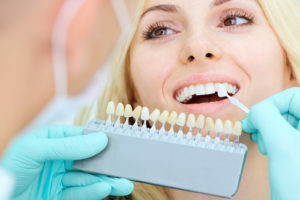 These steps should be virtually painless and can be performed while you are sitting comfortably in the dental chair; however, if you suffer from dental anxiety, our sedation dentistry techniques can help you feel more relaxed throughout the procedural process. At your return visit to our office, Dr. Morton will bond your custom-made crown to the prepared tooth. Following this procedure, your new porcelain crown should look, feel, and function like a natural tooth, helping to create a more beautiful, healthier smile. Dr. Morton makes every effort to ensure the dental crown process is as pain-free as possible. As previously mentioned, this includes the use of a numbing agent to desensitize the treatment area during tooth preparation and decay removal, as well as the employment of sedation techniques—such as nitrous oxide (laughing gas)—if needed. Our practice also offers blankets, warm towels, and movies during treatment, all of which can enhance your level of comfort. When all is said and done, the vast majority of dental crown patients note they experienced little to no discomfort at all. The cost of a porcelain dental crown procedure is based on your unique dental needs. After Dr. Morton evaluates your teeth and gums, he will create a treatment plan to address your concerns. At this time, a member of our staff will prepare a detailed cost estimate for your treatment. If you would like help navigating your insurance benefits or finding dental financing options, we would be happy to assist you. Our ultimate goal is to help you obtain the smile you desire. Dental crowns are designed to last for decades with proper care. They should be maintained with a good oral hygiene routine just like normal teeth. This includes regular brushing and flossing, as well as visiting the dentist at least twice per year. If these steps are followed, your porcelain dental crowns should last for many years. Can Porcelain Crowns Be Whitened? Teeth whitening products available today—both professional and over-the-counter—have no effect on the color of porcelain dental crowns. As a result, if you are in need of a dental crown and are unhappy with the shade of your natural teeth, Dr. Morton typically recommends receiving a teeth whitening treatment prior to the placement of your crown. This way, your crown can be precisely designed to match your new, brighter tooth shade as opposed to the current color of your teeth, which may create the need for a new crown in the event you wish to whiten your teeth at a later point in time. If you have any additional questions, or if you would like to schedule an appointment, please contact us today.